Spanning two levels of the sprawling Tobacco Docks exhibition site in central London, EGX Rezzed was a celebration of electronic gaming. A wide range of experiences were available to suit all palates, with some unusual offerings on display. At a stand decked out to match its game setting, players were challenged to get the fastest time driving a bagel around a virtual kitchen. The zombie apocalypse got a new twist, with the undead being mowed down by sloths with swords and elephants with machine guns. One developer appeared to confuse the “virtual” part of Virtual Reality, offering players the Oculus Rift experience of being shut in a coffin whilst actually shut in a coffin. Another demonstrated a new control system, with a game controlled by your breathing. Co-operative gaming took a new turn, with one player viewing a fantasy world on a tablet directing another player with a phone whose motion controlled the protagonist of that world. There was even a truly minimalist offering, with a dungeon crawler where the dungeon consisted of a single line of LED lights. Into this maelstrom I went in search of adventuring goodness. This is what I found. Tommynaut, brave explorer of the universe, is having a bad day. He and his blind alien dog sidekick, Beak-Beak, have crash-landed on a hostile planet. Having narrowly escaped being eaten by the local wildlife, the intrepid pair seek shelter in a nearby building. Little do they know that this is the fabled fortress of Armikrog, and many strange and wondrous revelations await them inside. It has been nearly 19 years since The Neverhood was first released on PC. Rather than a sequel, the cult classic claymation adventure is to get a spiritual successor in the form of Armikrog, with two of the artists from its predecessor, Ed Schofield and Mike Dietz, and writer/artist Doug TenNapel reuniting once more. The look is reminiscent of the earlier game, with stop-motion animation once again being used. Tommynaut is a humanoid character, though with grey skin and bulging black eyes. He clearly sees himself as a great hero, taking big strides and often adopting a hands-on-hips stance. His companion, dog-like but with a sharp pointed nose and two ridges where his eyes should be, is much more excitable. Both have been voiced by professional actors, and the quality of the sound recording came through. Tongue-in-cheek humour was central to the script, especially with the somewhat acerbic put-downs of Beak-Beak. The demo on display consisted of the opening rooms of the tower, the scenery including high-vaulted rooms, some sporting vast machine parts, and some peculiar alien wildlife. The makers boast that there are no simple decorations in the game, with all markings and objects having a purpose. For some, these are simply to provide more life, such as the activities of the local fauna as viewed through a window. Sam Forrest, from the game’s publisher Versus Evil, was keen to ensure I saw that this was not just a one-off. Clicking this window repeatedly produced a series of animations. Given how time-consuming the animation method is, and that many players would not consider clicking more than once, I found this a surprisingly pleasing attention to detail. Recorded at 30 frames per minute, the animation overall is nothing short of amazing. I have seen too many games have a character just vaguely wave their hand at objects to pick them up. No such shortcuts are taken here, and the gestures for even picking up an item are so grandiose they are a joy to watch. Inventory is handled automatically, with Tommynaut literally placing objects within his chest for later retrieval. It is also possible to temporarily take control of Beak-Beak to access areas too small for Tommynaut. When in an area only occupied by Beak-Beak, the graphics change to a slightly blurry black-and-white appearance, representing his blinded sense of his surroundings. This also revealed extra detail in one location, so it would appear Beak-Beak’s non-visual sense can “see” things Tommynaut can’t. By the time I’d finished the demo I’d gained part of a code, called a tentacle to operate as a lift, and seen some surreal but funny animal antics. Just this brief try, covering less than half a dozen rooms, certainly left me eager for more. The creators are definitely not just relying on nostalgia for The Neverhood, and I look forward to seeing the finished product. 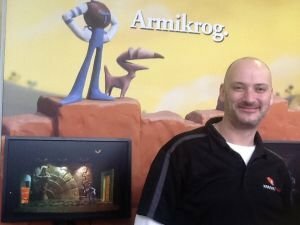 With the game on track for release sometime this spring, you can find more information about Armikrog at the official website. Eliot Ness is the American Prohibition agent who achieved fame bringing down the gangster Al Capone. In this new episodic game from A Crowd of Monsters, Ness has subsequently retired to run the titular Blues and Bullets diner in the town of Santa Esperanza. The place is a favourite haunt of cops, eager to regale the retired lawman with current tales of life on the force. Then one day a new face at the counter brings Ness’s past back to haunt him. Capone’s granddaughter has been kidnapped, and his former nemesis is the only man he trusts to get her back. Ness agrees, but with gruesome murders and gunplay to face, he may wish he’d stuck to serving pie. The game’s graphics are a realistic representation in all but one aspect: everything is coloured in black and white with the exception of red items. The overall feel is very much of a gritty noir detective thriller. With murder being a key part of the action, this often means blood trails, though Ness’s tie and a sporty car also get coloured. The look is fully 3D, with high resolution and detailed facial expressions. Visitors were able to choose from four scenes to play in the demo. The first scene took place in the diner, where you served coffee and food to your loyal clientele. This is clearly intended to be the tutorial level for the game itself, involving simply moving around and a handful of simple actions. When conversations needed a response, these were presented as brief one- or two-word descriptors scattered around the protagonist, each associated with a particular controller button. The other scene I played was a horrific murder scene. This was extremely graphic, ensuring that Blues and Bullets is not going to be a game for the young or squeamish. In this section it was necessary to walk around the crime scene looking for clues. Moving around caused areas to highlight as you approached them, with a button press zooming in for a closer look. Manipulating the camera in these close-up views allowed more precise details to be observed, with clues being pinned to a virtual incident board. A single button press provides access to this board, allowing you to link clues together, with the intention of getting more insight into the crime. As well as simply observing, I also discovered a room apparently secured from the inside, though I failed to work out how to gain access. One of the other scenes available involved a shoot-out, which will require some skill to pass, but I am assured that these are likely to only take up 10% of gameplay at most. The set-up is definitely intriguing, with the opportunity to control such a legend of law enforcement most enticing. The graphics are beautifully rendered, really conveying the horror of the more shocking aspects of the murder scene. The dialogue I heard is extremely well-written and the delivery, especially Ness’s gravelly tones, is spot on. 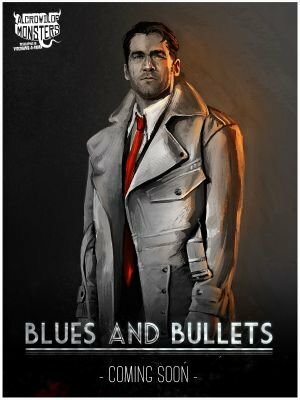 The first episode of Blues and Bullets is due for release in May 2015, with five episodes planned in total. To learn more about the series, visit the developer’s website. 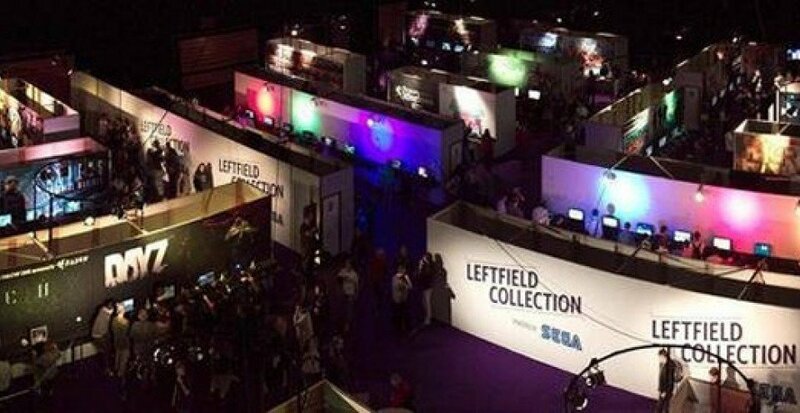 I was at Rezzed too and three of my favourite puzzle/adventure games were Mushroom 11, Knee Deep and The Room Three. Did you guys get to try those? They were outstanding, even considering Knee Deep is conversation focused (and usually not my style of game). I enjoyed Toren a lot in the short time I could play it and it reminded me so much of Ico and Shadow of the Colossus. I wish I could have seen a few of the other ones, but I had some planned interviews with some of the devs and sometimes the queues for the games were so long I just didn’t get the chance!